Don’t worry – this column hasn’t gone soft. In my March 30 column, I praised the Wisconsin District IV Court of Appeals for their opinion in Derr v. Derr, No. 03-2181 (Wis. Ct. App. Mar. 17, 2005) (recommended for publication). The main portion of the decision cleared up years of confusion regarding non-divisible property, adopting a clear, consistent scheme which will undoubtedly serve as the lodestar for trial courts for many years to come. This week, however, is devoted to a lesser portion of the opinion that might prove problematic. While the major portion of the court of appeals decision dealt with the issue of divisible versus non-divisible property, the appellate court also affirmed Dane County Circuit Court Judge David Flanagan’s decision regarding the husband’s income available for support and the husband’s dissipation of assets. It is the dissipation issue which triggers some concern. In Derr, the husband engaged in day-trading stocks, resulting in a loss to the marital estate of $45,000. The trial court found that this loss constituted a “waste” pursuant to Wis. Stat. §767.275 and charged husband with this amount in arriving at a property division equalization payment. The appellate court affirmed. After discussing the statute and the burden of proof, the appellate court noted that the circuit court found that the husband did not give clear or credible information regarding the loss of the monies. The appellate court held that the circuit court correctly held that the husband wasted the funds and that the timing of when the loss occurred was unimportant. A trial court has the authority to find dissipation both by statute and by case law. 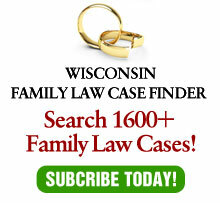 See Anstutz v. Anstutz, 112 Wis. 2d 10, 331 N.W.2d 844 (Ct. App. 1983). But there has been little case law defining the extent of the trial court’s discretion. In certain cases, the dissipation issue is rather easy. For example, if one spouse spends marital funds on an illicit relationship with a third party, few courts would rule that such an expenditure should be charged to both spouses. Gambling losses are more problematic. To the extent that gambling is an entertainment expense, it is not any more a dissipation than any other entertainment expenses, like sporting event or theater tickets. At a certain point, however, the losses may be so great as to cause a court to find it to be more a waste of marital assets than a legitimate entertainment expense. This point is usually crossed when the losses cause significant debts to the parties as a result of addictive gambling. Typically, investment losses are not treated as waste. For example, in Hauge v. Hauge, 145 Wis. 2d 600, 427 N.W.2d 154 (Ct. App. 1988), the court held that a debt arising from an investment was not a dissipation, even though the investment was made while the parties were separated. Usually, the issue arises when the investment is a high risk one, such as the futures market. Even so, however, to rule that these losses are a waste could lead to an absurd result. After all, if the investment succeeded, certainly the other spouse would want half of the profit. It is inconsistent to be willing to share the profit if the investment goes well, but not share the loss if the investment goes poorly. If the Derr case is read by trial courts only on the narrow procedural basis that consequences can ensue for failure to provide credible information, this portion of the decision has great value . On the other hand, if the decision is read broadly, as affirming the trial court’s substantive result that money lost as a result of day trading is a waste, the contradictory result stated above could materialize. Therefore, it is hoped that trial courts will interpret this portion of Derr as a procedural ruling and not intended to find that both spouses benefit when speculative investments do well, but only one pays the price when the contrary result occurs.